A proprietary technology guarantees a reproductible manufacturing process of calibrated magnetic emulsions. 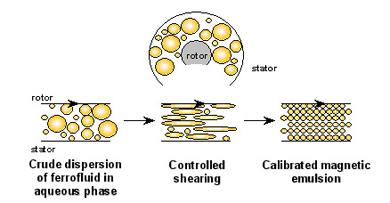 The fragmentation under controlled shearing allows for the preparation of 100nm to 500nm uniform magnetic emulsions. The nanoparticles are superparamagnetic: they exhibit magnetic properties only when placed within a magnetic field and show no residual magnetism when removed from this field. Ademtech has developed in-house polymerisation process ensuring an efficient isolation of the magnetic core, a tuneable functionalisation and a high colloidal stability. The polymer provides the magnetic core with a uniform protective shell in order to isolate iron oxides that can interfere with some enzymatic reactions. The hydrophilic surface lowers non-specific interactions with proteins. The high magnetic content (more than 70%) ensures a quick and gentle magnetic separation even for the smallest particles with a simple magnet. Ademtech has developed simple and reproductible protocols for coupling proteins to its nanoparticles yielding to high binding capacities while keeping non-specific binding low and ensuring longterm stability. Self-organisation of magnetic particles occurs when stimulated by a magnetic field. Separation is gentle and no column or centrifugation are necessary.